Young Guard activists picketing a Mormon youth center in central Moscow on Thursday. A week after President Vladimir Putin called totalitarian sects a "threat to society," pro-Kremlin youth activists in Moscow staged a picket against Mormonism, accusing the U.S.-based religious group of a range of crimes from fraud to pedophilia to sheltering CIA agents. In addition to its stated goal of fighting lawbreakers, Thursday's protest by United Russia's Young Guard appeared aimed at raising fears about Western influence, a growing trend in recent months. Just as non-governmental organizations that receive foreign funding have been branded "foreign agents," Mormons, Jehovah's Witnesses and other Western religious groups are being flagged as dangerous, said Roman Lunkin, a religious expert at the Russian Academy of Sciences. "For 'patriotic society,' they're seen as a fifth column," he said by telephone on Thursday. Protesters said the Mormon church shared the political views of its most famous adherent, U.S. presidential candidate Mitt Romney, whom the youth group, an arm of the ruling United Russia party, also denounced as a "Russophobe" in an online statement. Romney is "a representative of a totalitarian religious sect that operates on Russian soil against the country's interests," the statement said, although a Young Guard leader reached by telephone on Thursday denied that the protest was linked to Romney. The Mormon church's local branch reacted calmly to the news that similar pickets were to take place in seven Russian cities, a church spokeswoman said. She added, however, that the church had asked authorities to check the legality of the Moscow event. 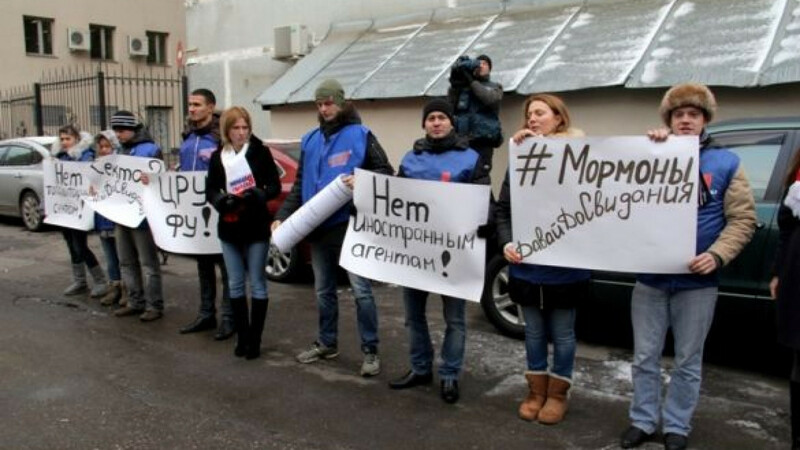 About a dozen Young Guard members stood outside a Mormon youth center in Moscow on Thursday wearing matching blue vests and holding handmade signs that read, "No totalitarian sects!" "CIA, yuck!" and "No foreign agents!" The group cited Putin's remarks as an impetus for the event, claiming in their statement that Mormons are one of several groups, including Jehovah's Witnesses and Hare Krishnas, that are dangerous to Russian society. Putin had not referred to any religious group by name. Mormons might have been singled out because anti-sect activists are suspicious of the faith's significant public presence, which includes charity and missionary work, Lunkin said. "Anti-sect activists create this myth about a nationwide network of organizations … supported by the West," he said. Citing a 12-year-old story in an obscure Kaliningrad newspaper, Young Guard said some Mormon missionaries doubled as Western intelligence agents. Last year's conviction of Warren Jeffs, leader of a fringe Mormon sect, on child sexual assault charges was the basis of the pedophilia claim. Yelena Nechiporova, the Mormon church spokeswoman, dismissed the charges. "We believe in the law, and we follow the law. … We're here to live in the country where we were born and grew up, the country that we love," she said by telephone on Thursday. In August, a police raid on an Islamic sect in Tatarstan spawned lurid rumors and increased scrutiny on perceived fringe religious groups. Last week, Putin told a Samara regional official that totalitarian sects "hunt for souls, as well as property," and said laws regulating their activities should be improved, a remark that prompted Public Chamber member Alexei Grishin to propose creating a register of "totalitarian sect" leaders. The Mormon church, officially known as the Church of Jesus Christ of Latter-Day Saints, has operated legally in Russia since 1991 and has 21,000 members in the country. Of the 500 missionaries active in the country, about three-fourths are Americans, Nechiporova said. There are an estimated 14 million Mormons worldwide.